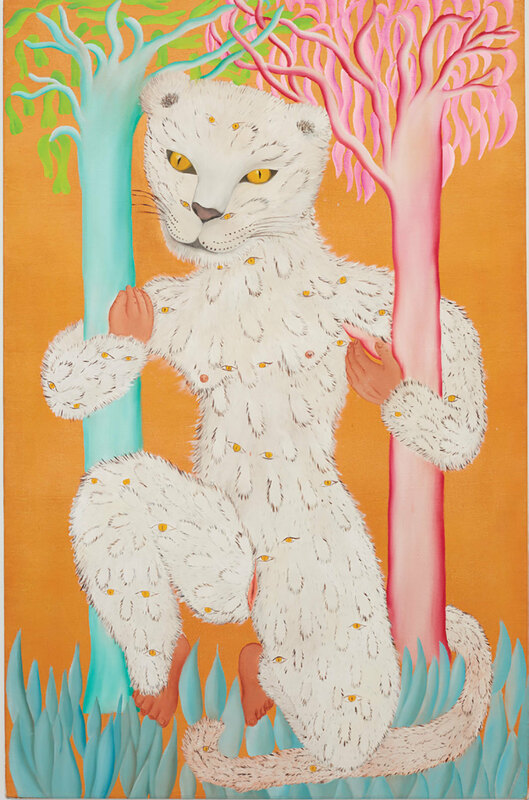 Cecilia Vicuna, Leoparda de Ojitos (Leopard of Little Eyes), 1976, oil on canvas, 55 3⁄8 × 35 1⁄2". Entering “La India Contaminada” (The Contaminated Indian), Chilean artist Cecilia Vicuña’s first survey in New York, the viewer encountered Quipu Viscera (Visceral Quipu), 2017. Numerous swaths of unspun wooldyed various shades of pink, peach, and heliotropecascaded from the ceiling, amassing in a fibrous, flesh-colored forest. 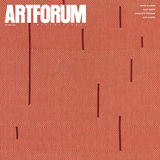 While the first word of the work’s title refers to the intricate system of knotted cords used by pre-Columbian Andean cultures for accounting and record keeping (a concept that has motivated much of Vicuña’s fiber-based art since the mid-1960s), the second accurately describes the work’s intestinal appearance and bodily appeal. Immersive but not overtly interactive, the long and linty filaments simultaneously provoke and frustrate the desire to touch.